The AQ7280 is the most flexible OTDR in our lineup due to a modular platform to create a variety of systems from a basic unit to units with filtered ports to test live traffic networks in applications from long haul, to metro, core and FTTH. 35+ years of OTDR expertise has enabled us to offer a unique multi-tasking feature that allows four distinct fibers to be tested simultaneously. Its intuitive icon-based touchscreen lets users perform measurements with ease, and the 15-hour battery life ensures uninterrupted usage in the field where the data can be conveniently transferred wirelessly. 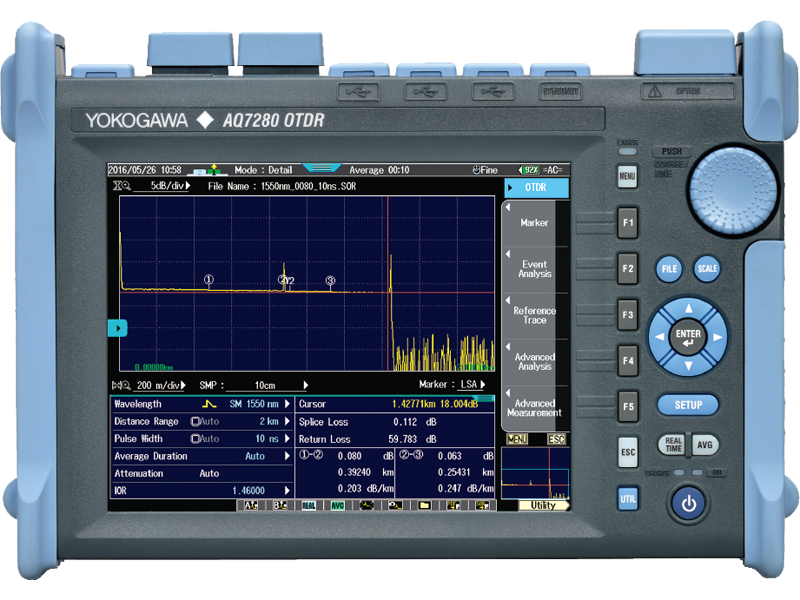 The AQ7280 satisfies a broad range of test and measurement needs in analyzing optical networks from access to core. Reliability: Robust design for operating under harsh field conditions. Proven operating system assuring stability, prompt response, and superior protection against software virus attacks. Ease-Of-Use: Dual operation mode by multi-touch touchscreen and hard-key buttons. 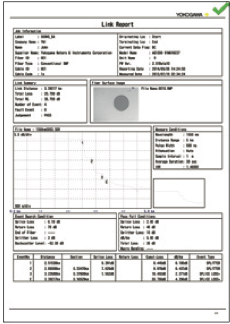 Fully automatic measurement and easy-to-read analysis reports through new software applications. 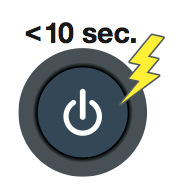 Speed: Lightning startup time. Multi-tasking operation to enhance productivity. Immediate reporting via wireless connectivity. Managed by a highly efficient operating system, multiple functions can work simultaneously. 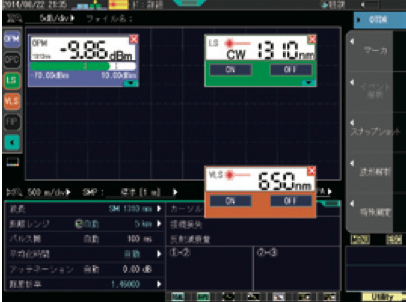 Now, users can perform OTDR measurements on a particular fiber core while simultaneously checking the power level and connector surface quality on others. Touch screen and hard-key buttons! Tap, swipe, pinch, or press. Choose between the high resolution 8.4" multi-touch capacitive touchscreen or the robust hard-key buttons in any combination desired. OTDR operations have never been easier! Thanks to the latest high speed hardware and a highly efficient operating system, the AQ7280 starts up from completely OFF to measurement-ready in seconds. It's always ready when you are! Single button measurement. Comprehensive network characterization. Easy-to-read report. 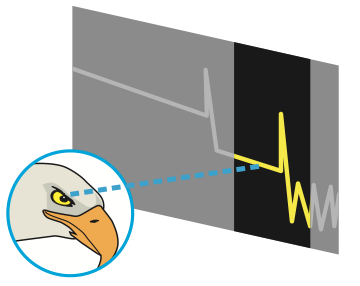 Measurement acquisitions with multiple pulse widths and smart-algorithm enable users to detect and comprehensively characterize network events by pressing one single button. Simple, icon-based map view for easy interpretation of network events. Immediate PASS/FAIL judgment based on user-defined thresholds. 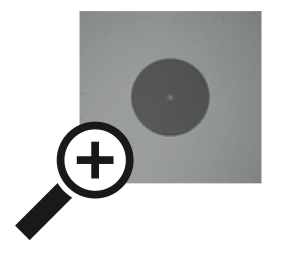 Easily toggle trace view for manual supplementary analysis. Database view. Organized. Quick preview of network characteristics. 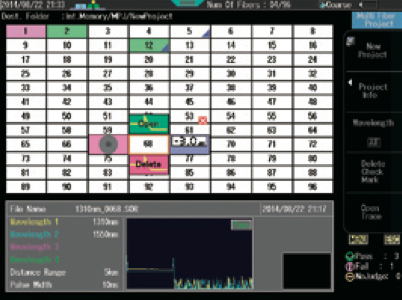 Guides users in tracking multi fibers measurements in sequence. Remote control. Remote data transfer. 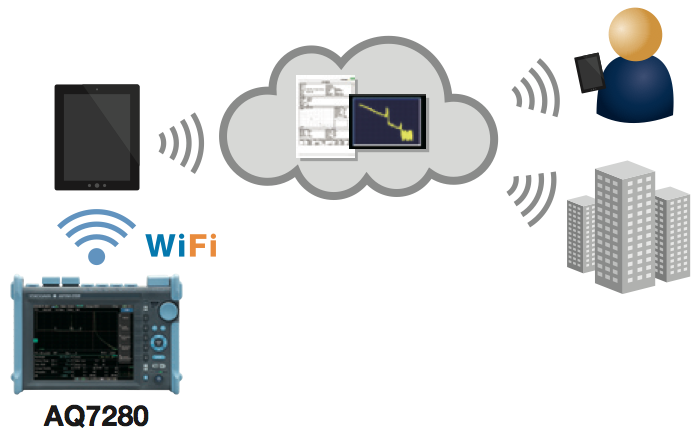 Control the OTDR remotely using WindowsTM operating system devices via wireless router connection technology. 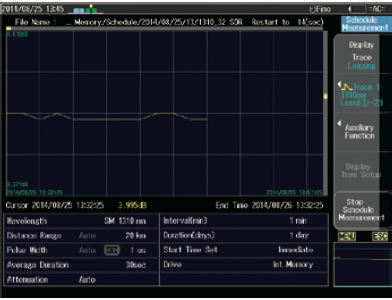 Transfer measurements results from the OTDR to WindowsTM operating system devices via FreshAirTM technology. Send the results/reports by email/file transfer software for immediate reporting. Hunt down your breakpoint precisely and promptly. 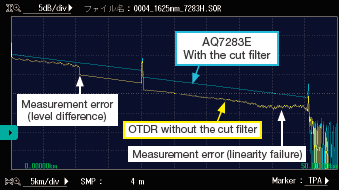 Enabling the highest possible sampling resolution in a long distance measurement range, distance offset error is reduced. With a relatively small distance offset error, users are able to pinpoint the actual break location in high distance accuracy. Faster location identification, faster repair time. Imagine working an entire work shift at your remote work site without worrying about running out of battery power. The AQ7280's powerful Li-Ion battery will last for an amazing 15 hours under the Telcoria standard conditions and 10 hours even with the laser continuously turned on! 9 OTDR units ranging from single mode to multi mode, from low dynamic range to ultra-high dynamic range, and 2 wavelengths to 4 wavelengths. Selection of power sensor, light source, visible light source, and fiber inspection probe for instrument's customization based on users' needs. Zoomed in, checked out, all fixed up. Using high-performance LightelTM fiber inspection probe, fiber connector surface is visualized for inspection of scratches and dirt. Reduces 90% of fiber cable problems. The fiber surface testing function will perform pass/fail judgment according to the threshold of dirt and scratches by automatically analyzing the image data of fiber surface received via the fiber inspection probe. Pass/fail judgment standard can be set to IEC61300-3-35 compliant or customized settings. In order to receive fiber surface data, you will need a fiber inspection probe (Lightel DI-1000-B2) which is compatible with the AQ7280 OTDR. Using the AQ7280's Wireless Connectivity, the PDF reports can be transferred through the internet for immediate reporting. Under cold weather conditions, fiber network connectivity can be interrupted intermittently due to bending or losse connections. Identifying such intermittent interruption requires periodic monitoring and advanced analysis algorithm. 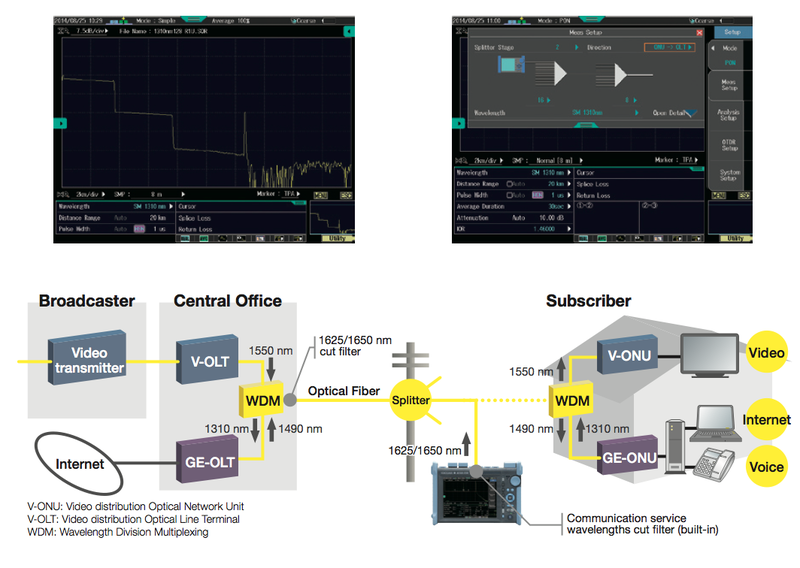 The OTDR Schedule Measurement function is useful when monitoring a particular fiber core based on user-defined measurement period and interval. Measurement results are compared with a reference trace and analyzed for any discrepancies. 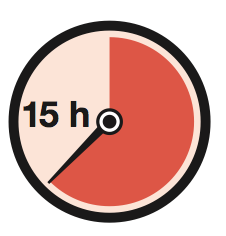 Based on the user-defined loss threshold, discrepency at a particular distance is identified and the occurance time is recorded. 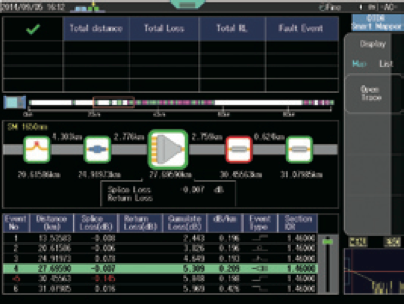 Thanks to the OTDR's advanced analysis function and macro bend characteristics, users can immediately identify and locate macro bend events along a fiber network. Multi-wavelength traces are acquired on the same fiber, then is compared and analyzed automatically in a single-button operation. 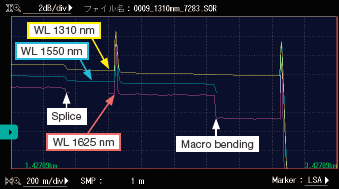 When the loss difference of a same location event at different wavelengths is more than the user's defined threshold, the macro bend is detected! The Fault Locator is an OTDR-based application for simply identifying the fiber break location. Adaptive, smart-algorithm based on selected network architectures, such as point-to-point or PON network topology. Simple view of distance information for easy interpretation. Easily toggle trace view for additional detail analysis. Excellent hardware performance and advanced analysis algorithm enable the AQ7280 to accurately characterize Passive Optical Network (PON) through high-port-count splitters (up to 1 x 128). PON mode assists beginner/expert users in simple configuring OTDR measurement settings based on PON topology information for optimal results. Short event dead zone and high sampling resolution enable users to detect near-end location of connectors that are as close as 0.5 meters (With the built-in optical cut filter and dedicated measurement port, the AQ7283F module is capable to measure live PON for maintenance purposes. A wide selection of diaplay languages assists users in operating the AQ7280 in their native language. Available languages influde, but not limited to: Chinese, Czech, Dutch, English, Finnish, French, German, Italian, Norwegian, Polish, Portuguese, Spanish, Swedish, and Turkish. Supports the water-peak wavelength of 1383 nm where water ions (OH) in optical fibers absorb light. Suitable for the inspection of optical fiber production and the cabling process of optical fibers. Its portability allows the on-site testing of communications network lines when CWDM networks are introduced. Traditional single-mode fibers (SMF) contain a large amount of water ions (OH). 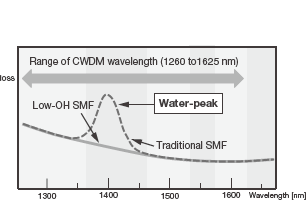 Since water ions (OH) absorb light at 1383 nm, the optical loss of single-mode fibers increases at 1383 nm, this characteristic is known as the water-peak. The AQ7283J was designed with the 1383 nm wavelength capability to specifically test the water-peak in SMF. Low-OH single mode fibers*¹ are available for CWDM applications. They are tested at 1383 nm in each process of production. 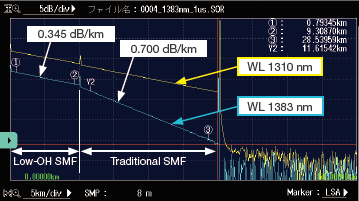 When the introduction of the CWDM transmission system to existing optical fiber networks is considered, the optical loss of the network at 1383 nm needs to be measured because a traditional optical fiber may be used. Thanks to its portable design, the AQ7283J OTDR unit can measure the loss at 1383 nm on-site where optical fibers are installed. A built-in 1625 nm port with a cut filter to isolate from the communications wavelength enables the measurement of live-lines without being disturbed by active communications signals. The wavelength accuracy of 1625 nm ±10 nm is guaranteed to enable maintenance of 10 GE-PON. Whereas other OTDRs with a broader wavelength tolerance could disturb the 10GE-PON transmission signals. Note: The AQ7283F is another three-wavelength model with 1310/1550 and filtered 1650 nm. The built in communications wavelength cut filter in a dedicated 1625 nm port enables testing of fiber where live communications traffic wavelengths (1310, 1490, 1550 nm) exist. The optical transmission loss of optical fibers at long wavelengths like 1625 nm increases at the point where the macro-bending occurs. 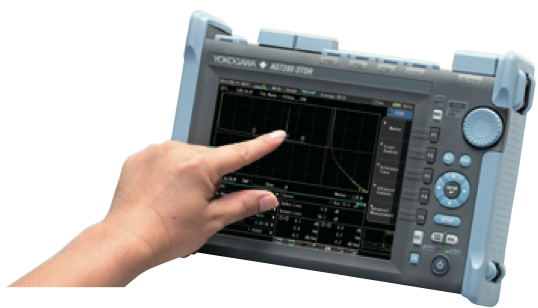 By comparing OTDR waveforms measured in each wavelength, the macro bending can be detected. *Other OTDR units with 1625 nm: AQ7283H, AQ7283K, etc. Suitable for the installation check of FTTH networks that requires the measurement at 1490 nm. More affordable price than the AQ7283K that is a four-wavelength model with 1310/1490/1550/1625 nm. This is a license product for adding applicable optional features on to AQ7280 series on your own. It is necessary to update main unit firmware in advance to R1.07 or later and above in order to apply this license. 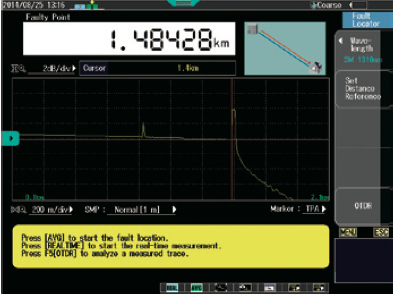 Measures and displays optical power of a light source as an absolute/relative value for testing transmitter/network performance. Measurement results can be saved for reference purposes. Invaluable test instrument during installation and maintenance. Calibrated and selectable wavelength setting. Single-mode and Multi-mode measurement ready. Continuous wave and modulated wave detection capability. Two selections of optical power sensors are available- optical power meter and optical power checker, different on the specs and functions. Outputs a stable, continuous wave of light for measuring end-to-end attenuation accurately when paired with Optical Power Sensor. Modulated light function at 270 Hz/1 kHz/2 kHz is also available for fiber identification or continuity check purpose on a live fiber network. Visible, continuous/modulated red light laser. Invaluable test instrument for checking the continuity of pathcords, launch fibers, or short fiber trunks. Breaks and bendings in fiber can be identified visually as the visible light exits the fiber on such fault events. Reduced energy, emission of CO2, NOX and SOX about 18% to 33% compared to the previous model. * For the countries that require CE marking. * For outside the countries that require CE marking.